5793 labyrinths found. Showing 5081-5100. Sorted by country, state, city, then zip/postal code. At Mas de l'ange (house of the angel) a private residence and lavender farm located off US 77A, between Cuero and Yoakum, Texas. Mesabi Black, quarried in Babbitt, MN and Radiant Red, quarried in Fredericksburg, TX. Tuesday through Friday 9 AM to 4 PM. 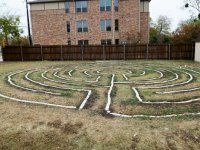 The Labyrinth is located on the side lawn of the home and is open to members of the Wynnewood North Neighborhood Association, as well as its friends and guests. S Manus is near the intersection of Clarendon Drive and South Zang Avenue in the Oak Cliff area of Dallas. 7 Circuit St. Paul, based on Chartres labyrinth. Jamie Klingenberg of "Gardens for Texas"
The Cathedral located in Dallas has 4 labyrinths: a 35 foot Chartres version on canvas which is set up periodically in our interfaith Peace Chapel for specific liturgical occasions; two are located in the children’s educational area – one in the Children’s Chapel (called Lydia’s Labyrinth) and one in an adjoining room with a hand-painted mural of Daniel in the lion’s den (called Daniel’s Labyrinth) [available by reservation]; and the last one, a Cretan, is located outdoors on the right of our St. Francis Garden and down the hill by the creek. The canvas version is set up once every two months. Always open except when campus is closed from 11 pm to 6 am. 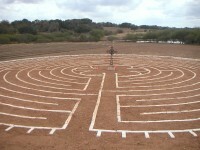 Adaptation of Santa Rosa Labyrinth by Lea Goode-Harris. The labyrinth is on the south side of the church, on the corner of Sycamore and Wainwright. Based on the Triune Labyrinth by John Ridder. with pavers for the walls. across from Dripping Springs Elementary School, next to DS Ranch Park arena. Enter church property at the New Life Lutheran sign, parking is on the right. Follow signs for walking trail to labyrinth and outdoor chapel. Call for availability. Available during office hours (9-2 M-F), and by appointment on evenings and weekends. Reported as neglected, behind a chained and locked fence. The church is located in central El Paso with the labyrinth located next to its freestanding bell tower and preschool. 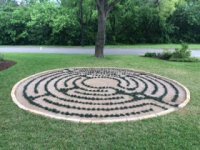 Available 24/7, however, during church and preschool office hours, please contact Patty Herrera, Church Secretary, before using the labyrinth. Church office hours: Monday thru Thursday 8:00 am - 5:00 pm, Fridays 8:00 am - 3:00 pm. 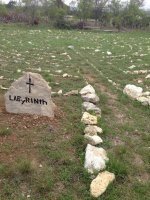 Groups must call Parry Herrera, Church Secretary, to reserve the labyrinth. The circular paths of the labyrinth surround a heart shaped brick platform. At the pastoral center, between the San Martin de Porras conference center and the agricultural field. 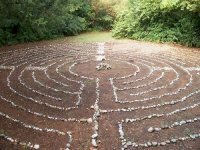 It is the traditional 7-circuit cretan labyrinth. 31 N ° Lat. ; 106 W° Long.